The MapFinder app will remain for customers to use and access their purchased map tiles but unfortunately will no longer be updated with new features and content. 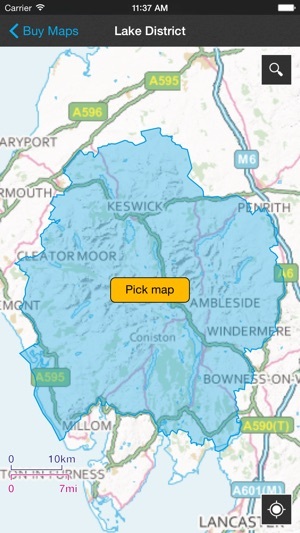 For the latest and most up to date app from Ordnance survey search for ‘OS Maps’. This app also allows customers to download a digital version of their paper map, and view and subscribe to see all of the GB Ordnance Survey maps. OS Maps won the Digital Product of the year 2017 by the Outdoor Industry Association. Please note: OS Maps and The MapFinder are not compatible and therefore purchases cannot be transferred between the apps. The MapFinder is a large download. 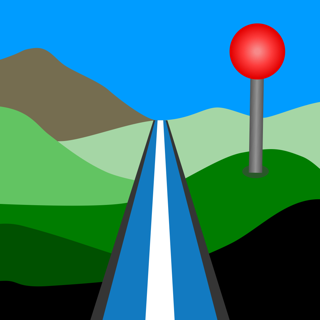 With it, you can search our 1:250 000 scale road map by place name, postcode or address. You won’t even need an internet connection to search as it also works offline. Then, via the in-app options, you can buy the OS Landranger (1:50 000) and OS Explorer (1:25 000) close-up maps of the areas you’d like to focus on. Despite our original commitment to maintain this application until April 2016, we have continued maintenance into 2017. Whilst we will no longer develop content and features going forward, the application will still be available for existing customers to continue to use their purchased content. As operating systems are updated the application may become less stable. 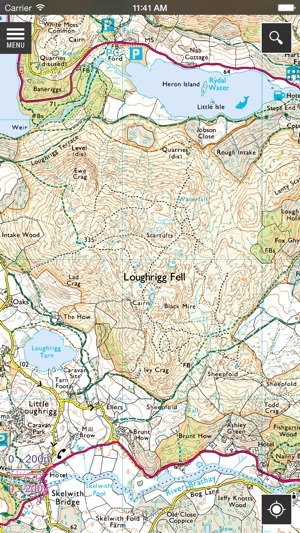 For the most stable and up to date application from Ordnance Survey we would recommend the OS Maps app. The app is a large download. It has to save the maps and search database to your device. Please make sure your device has enough free space and you’re connected to a stable WiFi point before starting the download. The purchasable map sections are around 60MB each. If you want to save space, you can remove a purchased map section from your device, and then download it again (free of charge) when you next need it. Continued use of GPS running in the background can dramatically decrease battery life..
or via email at customerservices@os.uk. I'm really happy OS have made this app. I'll be visiting my home town of Bath next week and being able to get offline OS maps on my iPhone and iPad for hiking around the outskirts of the city is really great. 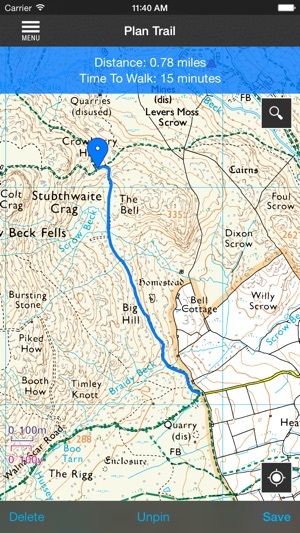 Also having OS maps to plan with in advance is fantastic. I'd love to see the overall app navigation simplified as it can be a little confusing in places. I think the use cases may need to be rethought a bit. Also adding pins to the map would be great, in addition to only routes (connected by lines). Also I'd make this 5 stars if you implemented iCloud sync of planned and recorded routes. I would like to plan routes on my iPad's big screen but take my phone with me on hikes. Also I'm not sure why the app is 350+ megabytes. Surprisingly large? By far biggest issue is cost: as an example, my bother lives near the intersection of 4 tiles, so walks we take mean buying all 4 tiles. I can access Google maps for free. Obviously, I would prefer OS maps, but for a single walk with my brother I think I'll stick with Google. I'd need to be doing regular walks in an unknown area to justify buying maps. The other deficiency is that GPS real time data does not tell me my altitude/elevation as I walk up a hill. I want this also recorded to show a chart/graph of my walk's cross-sectional height. I used this app on a recent trip to England and when I didn't have cell coverage this app at least let me see where I was driving or walking. 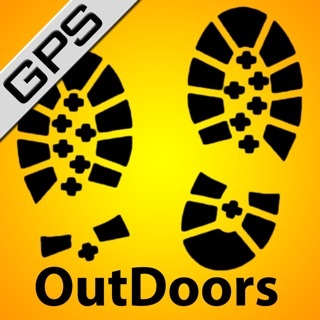 I could not figure out how to use it for all functions but for free it was a good gps finder. Too bad doesn't work in U.S.